A lovely Italian tradition is to serve some sort of snack with your cocktail or wine. Whether at 11:00AM, 3:00PM, or 10:00PM, you’ll get at least a bowl of potato chips, often peanuts or a spicy/salty snack mix, and sometimes tiny sandwiches or pizza bites. 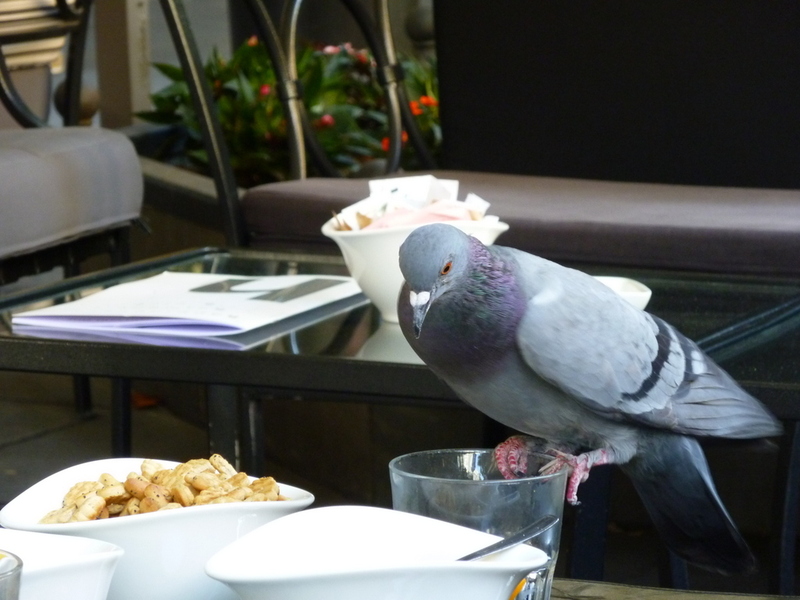 We enjoyed this “guest” that swept in to enjoy a few peanuts as soon as the couple abandoned table next to ours. Tha waiter didn’t think this was nearly as funny as we did. The pigeon downed about 20 peanuts in less than 30 seconds. Very unaccommodating waiter! Good looking pigeon. I don’t think it is missing many meals!!! Love your updates! You are having way too much fun!! LOL – Are you sure they were cocktails and not pigeontails?? Love, love, love your updates!!! Keep them coming! LOL indeed! unny he didn’t go after the dregs of the drinks!